Many, many times I've been asked, "How do you make that?" or even, "Do you really make all these things?" So I thought I'd show and tell a little of the process. 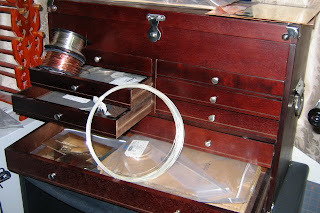 Most of my work starts out as a coil of silver or copper wire of varying gauges (thicknesses). Some of it, such as the cuffs, begins as a plain sheet of silver or copper. I keep the raw materials in a chest by my bench. Today I'll just talk about how I make the chains. 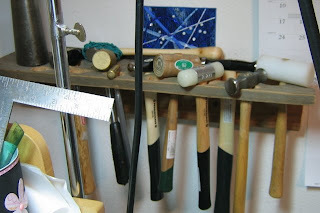 First, I cut off a length of wire and wrap it around a wooden or steel dowel until I have a coil of 20 to 50 or so links, depending on the size. 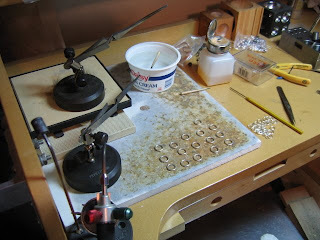 I use a jeweler's saw to cut the coil down one side to make a bunch of open links. Next, I use pliers to push the ends of the links flush together. I then solder some of the links closed with an oxygen/propane torch. I line a lot of them up at one time, and this is what it looks like (except that the board is usually at least half full of links). Next I hammer each link of the chain. Here are my beloved hammers. See the one in front on the right? That's a planishing hammer, and I use it 90% of the time. It's my oldest and most beloved hammer. After everything has been hammered, I toss it in a rotary tumbler with steel shot and let it go for up to eight hours. This is where it gets the bright, shiny finish. 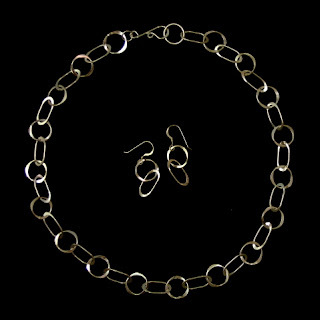 And here you have an 18-inch "Paperclips" chain and earrings with 42 individually soldered and hammered links. We all need hope — and sometimes a little help, too. 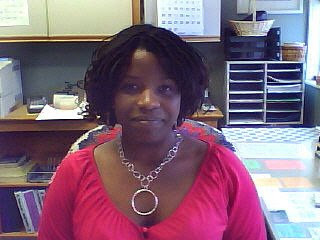 The necklace is sterling silver. Both the hammered round-linked chain and the large circle focal point are incised with lines, which create real sparkle when polished (and will make an interesting, almost tribal, pattern if you prefer to let your silver oxidize naturally over time). You really should go to the auction and get a good look at it for yourself. Here are the details. at the Westmark Hotel Gold Room in Fairbanks. All proceeds benefit the programs of Fairbanks Counseling and Adoption, which provides counseling and support for families, pregnant women and girls, as well as adoption services. For more information and tickets, please call 456-4729. I'd love to hear from you if you're the lucky winner of the Circle of Hope. I will be happy to make earrings to match! After much prodding and a few well-placed (but gentle) boots to the figural behind, I'm starting a blog for Tin Cup Designs. I don't know why it has taken this long, because I've always wanted to share my creative process, new designs and upcoming shows with you. And I certainly want to hear what you think, so please let's make this a conversation. The pendant at the top is one of the new pieces I've just finished. There will be more very soon, I promise. This one is called "Chained Heart." 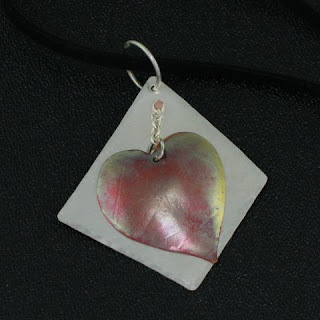 It's a repoussé copper heart attached to a matte-finished sterling silver trapezoid with hammered edges. The heart swings back and forth on a tiny silver chain attached by a copper rivet. I've been thinking a lot lately about the paradoxes of loving anyone or anything deeply: How love can make your heart soar, free as a bird — and then tether you before you get too far away. How the bonds of love can be a comfort and, sometimes, an uncomfortable limit. Most of all, how love truly is the energy that fuels the Universe, and that when I'm really working — when the hammer sings and the metal dances — I'm filled with it.